Sara’s love for the hair design industry has taken her on a journey toward a successful career both in and out of the Cassandra salon environment. Since graduating from cosmetology school in 2003, Sara has aspired to achieve her goals with diligence and a work ethic second to none. Having the opportunity to have trained and worked with some of the world’s finest hairstylists in the industry today, Sara continues to be inspired, committing herself to a higher standard of performance and art with her clients. 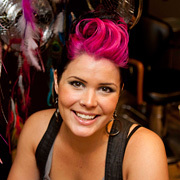 As a national educator for HairDreams, a world-recognized leading brand of hair extensions, Sara travels extensively throughout the US and Canada, conducting certification training for salons and performing her styling techniques on stage at trade shows including the ISSE Long Beach, the Chicago Midwest show and the Intercoiffure Mondial in both New York and Las Vegas. Having her talent for hair design with extensions featured on the model makeovers for the 2010 season of Germany’s Next Top Model with Heidi Klum is a major accomplishment that she is very proud of. Sara excels in the art of extensions. No longer satisfied applying extensions solely for length and fullness, she insists on stretching her imagination to its limits by discovering fun and exciting ways to incorporate them into her color and cutting techniques, creating new style designs without the use of chemicals.Additional accomplishments to Sara’s resume include Goldwell color training, Bio Ionic Retex certification (straightening), along with cutting and styling classes through Robert Cromeans, Rusk, Aquage, Paul Mitchell, Scott Cole and Kenchii Shears. She enjoys competing in avant garde hair design competitions and photo shoots, having had work featured in major trade publications, style and technical books. She is proud to have had her work grace the cover of the 2009 issue of Passion International Hair Magazine. Sara never passes on an opportunity to lend her talents to charitable events such as Home, Health and Hospice of Greater Nashua, Locks of Love, Fitness for a Cure’s annual galas benefitting St. Jude Children’s Research Hospital and other local events.Sara believes most in being a well rounded stylist, utilizing all of her talent and skill to make her clients feel their most beautiful and confident. To her, hair styling is not just a job; it’s an art and a passion!